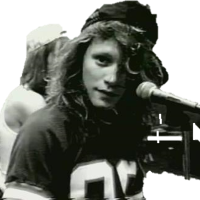 “Born to be my baby” started his journey on November 24, 1988. Bon Jovi released the hit just two months after “Bad Medicine” and after the release of the album “New Jersey”. Really they wanted to exploit the wave of success, and they really do! In fact this hit arrives at number one without too many problems. The video is peculiar. They filmed it in black and white, like other videos released from that album. We can say it’s a low budget video. They merged clips and footages of the days where they were recording the song. Actually Jon Bon Jovi’s wife also appears in the video. A the end, Jon starts kissing and hugging all the band. Do you know what had just happened before filming this scene? The producers just told Bon Jovi that “New Jersey” was at number 1 in the US charts!